The AZS15 is a configurable LVPECL, LVDS buffer & translator IC that is optimized for ultra-low phase noise and additive jitter operating at 2.5V & 3.3V nominal supply voltages. It is particularly useful in converting crystal or SAW based oscillators into LVPECL and LVDS outputs for signals up to 1.5GHz. 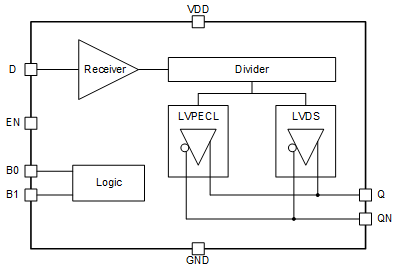 The AZS15 is a configurable IC design capable of providing LVPECL or LVDS outputs, ÷1 or ÷2 function, and active high or active low enable selection that provide designers with a single high performance IC buffer/translator solution that is extremely compact and flexible.